Winter Running – What to Wear? Question: since winter is upon us, I am looking for a jacket to wear while I run.. what are some good ones. I have no idea what i am looking for… what is a good price range too, that won’t break the bank. I wear rubber outer wear and jackets in the winter. So anything made with rubber. I have an Adidas jacket I got a couple years ago from Kohl’s on sale, for like $35 – it has an awesome pocket for my phone & pockets to stow my hat & gloves when I get warm & is a bright color w/ reflective accents, plus a hood. It’s wicking material & really durable. I wore it today for the first time since last late winter/early Spring & fell in love with it again. Brooks makes some really nice jackets. I wore my Adidas jacket all last fall & winter, in snow & sleet & 20 degrees & wind – just layered underneath. Fleece is warm and usually pretty affordable. Make sure it is wind resistant, water resistant, zippered pockets, a hood and a good fit! That’s what I look for anyway! stuff at target if fairly good. I bought a mid weight jacket for like $35 during the polor virtex days of January. Compression shirt as a base, then run shirt, then jacket. Wear Under Armour Cold Gear and you won’t need a jacket. Make sure whatever you get is breathable — nothing like trapping your body heat and sweat inside the jacket. Others may have said it already…..layers work the best for cold weather running. LOVE my Brooks jacket. Even in bitter temp (18 degrees) it kept me warm with just a long sleeve tech underneath. Have had it for 3 years. Cost was about $125. I am an old runner (67 y.o. 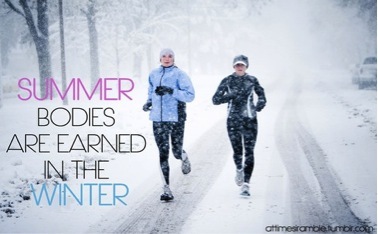 ), and have run in all kinds of weather. You don’t need any special jacket. Save yourself some money, and just dress in layers. On a long run, you might get too hot, and decide to take some stuff off. Also cover your ears, and get some good gloves… Good luck! This entry was posted in Question and Answers by Runners, Running Tips and tagged running gear, winter running. Running in the Cold – What do I Wear? Do you wear make-up when you run?